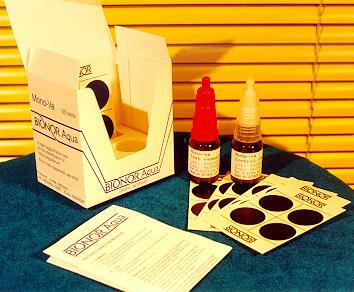 Mono-Aqua diagnostic kit: It comprises a kit complete with reagents and necessary cards in order to perform a quick (30 sec) sero-agglutination test on bacterial colonies that have been isolated on agar plates from the tissues of sick or suspect fish in the laboratory. Thus, it provides a fast and accurate identification of the pathogen bypassing the need to perform biochemical profiling. The kit's main novelty lies in the fact that it provides an additional "negative control antiserum", that is, an antiserum that reacts against bacteria with close antigenic properties with Vibrio anguillarum. When sero-agglutination occurs with the "positive antiserum" it should not happen when the bacterial colonies are tried against the negative control antiserum, providing extra confidence for the result. A drop of the antiserum is placed on the dark field of the test card. 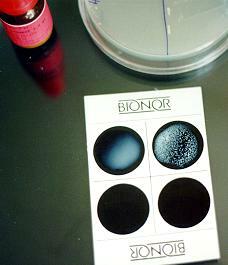 A bacterial colony is taken from the agar plate with the loop and homogenised for 30 sec. with the antiserum. A positive agglutination is characterised by the formation of a multitude of small spherical agglutinates, whereas a negative test shows either no agglutinate formation, or irregularly shaped, cloudy agglutinates.